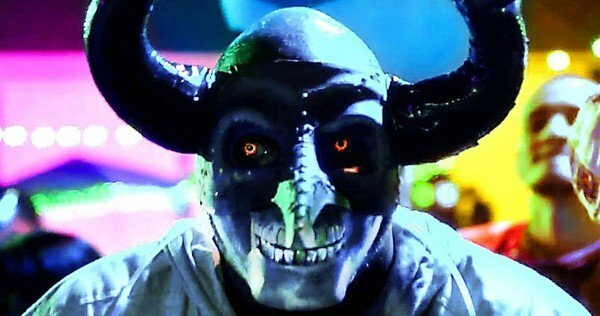 The First Purge Review: Tries to say a lot and ends up saying nothing – AiPT! Can The First Purge get its message across? The first Purge movie was a good idea that never rose above another home invasion movie. The sequel, Anarchy, added more social commentary and a larger setting but is little more than another violent dystopian story. The third installment, subtly titled Election Year, went full bore with its critique of America, but seemed satisfied to be an action movie with a feel-good ending. In short, the Purge movies have good intentions but end up falling way short. So why would a person who does not care for the series want to see The First Purge? On July 4th, tickets to all movies were $4 at the Alamo Drafthouse. True to its title, The First Purge is a prequel that takes the audience back to the original Purge. Dr. May Updale (Marisa Tomei) works with the New Founding Fathers of America (NFFA) on a large scale social experiment to see if venting violence is a suitable way of reducing it. The experiment is set to take place on Staten Island and the NFFA has grand ideas. As each new Purge movie has come out, they have strived to make meaningful statements about today’s America. The First Purge is no different, as the movie starts with a mix of real and fictional news coverage. From protests to the NRA, everything is touched on and it is impossible to separate fact from fiction. This is a sad commentary on today’s world and a promising start. Much like the other entries in the franchise, The First Purge never reaches its potential. In order to ensure people stay, the NFFA has agreed to make payments to anyone who does not leave during the Purge, with bonuses given for participation. This raises an interesting question: how far will people go in order to secure their financial freedom? The movie’s answer to the question? Never address this plot point again. This happens numerous times until it becomes apparent that the movie is content to bring up ideas just for the sake of doing so. Leaving questions unanswered is not the problem. There are many stories that will ask questions that are up to the audience to decide. However, in The First Purge topics are brought up and never addressed again. The whole exercise is random and pointless. True to form, The First Purge tries way too hard. There are men dressed in KKK garb attacking a church filled with minorities and a gang of police attacking an African American while apparently the only music poor people listen to is popular hip-hop artists. By the time a p---y grabbing joke was made, the theater I was in was so numb there was zero reaction. The First Purge is filled with action, a laugh or two, and some actual social commentary. Unfortunately, any poignancy is lost immediately and the movie turns into mindless action and tropes. In other words, it is as good as expected. The First Purge seem like it wants to deliver a message, but decides to focus on violence and action.